Home > Global Art > UNESCO Exposed! “There are no Armenian graves in the territory of Nakhchivan. This is just an Armenian fabrication.” Azeri Parliamentarian Rafael Huseynov, Azerbaijan State News Agency, 1/24/2008. Footage of 2005 destruction by Armenian Prelacy of Tabriz, Iran. Screenshot from “The New Tears of Araxes.” Written by Sarah Pickman. Narrated and Produced by Simon Maghakyan. © Simon Maghakyan, 2006. It was December 2005. 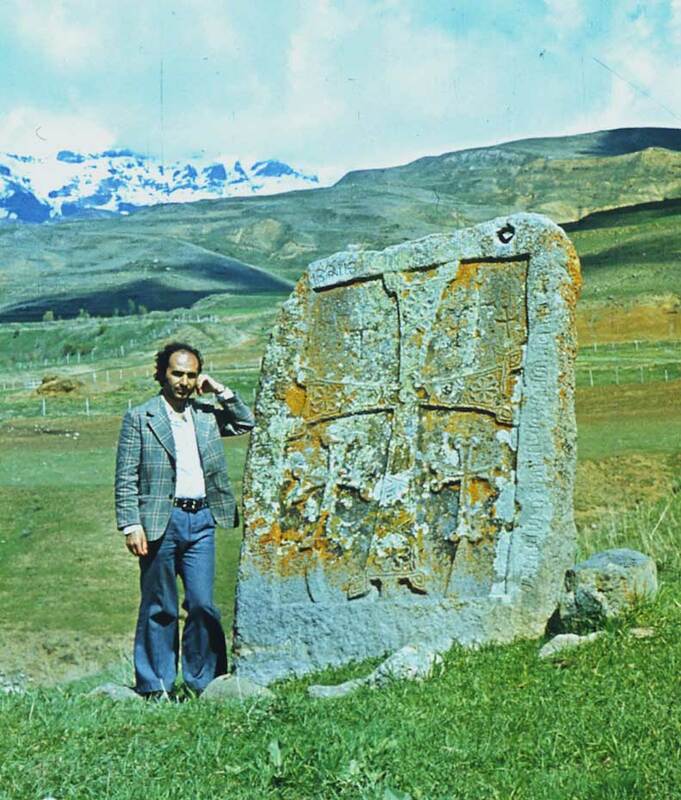 The greatest collection in the world of the Armenian Christian carved stone stele called khachkars stood within the ancient cemetery at Djulfa in Nakhichevan, in Azerbaijan. 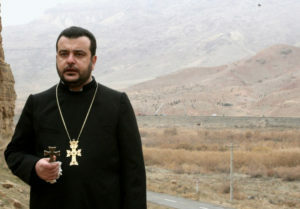 A few thousand feet away, just across the border in Iran, the Prelate of Northern Iran’s Armenian Church wept as he recited a service for the people who had been buried there for centuries, watching as Azeri soldiers used cranes and sledgehammers to destroy the ancient graveyard. 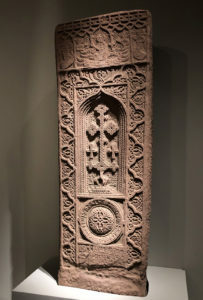 Many of the thousands of intricately carved, tall, standing cross-stones, considered one of the most extraordinary monuments to Armenian heritage, were over a thousand years old. The story of the destruction of thousands of cross-stones and 89 churches – the entire Christian heritage of the region of Nakhichevan – is detailed in A Regime Conceals Its Erasure of Indigenous Armenian Culture, by Simon Maghakyan and Sarah Pickman, just published in Hyperallergic and reported on by The Guardian. Many readers’ first reaction to the shocking report on Azerbaijan’s destruction of this world-renowned heritage site, was to ask, why didn’t UNESCO stop them? Unfortunately, that’s not what UNESCO does. The world thinks of UNESCO as focused on protecting international heritage for the benefit of all mankind. Increasingly, however, UNESCO defers completely to national governments over cultural heritage. It encourages demands for return of long-held objects from other nations, and at the same time, fails to insist on protections for cultural heritage within their boundaries – even, in the case of Azerbaijan, turns a blind eye when a government destroys it. UNESCO’s support for national over international interests and the rights of governments to control cultural heritage will certainly be on show in June and July 2019, when UNESCO’s World Heritage Committee will meet in Baku, the capital of oil-rich Azerbaijan. Newly elected World Heritage Committee Chairman, Abulfaz Garayev, who is also Azerbaijan’s Minister of Culture, will chair the organization’s 43rd session. UNESCO has never held Azerbaijan’s leaders accountable for the complete destruction of its Orthodox Christian heritage within the region of Nakhichevan. Instead, UNESCO seems eager to accept Azerbaijan’s rewriting of history. But the 2005 annihilation of Djulfa’s magnificent cross-stones is a cultural crime that neither UNESCO nor the Azeri government can deny. The historic sites most recently demolished by government forces in Nakhichevan have already been subjected to a long history of conflict. Once known as the autonomous Republic of Nakhijevan, the region sits between Armenia, Iran and Turkey. It was considered an Armenian province when it was annexed by Czarist Russia in 1826, and then delivered to Azerbaijan in 1921 in the Turkish-Russian Treaty of Moscow. In 1919, massacres of the Armenian population and forced removals took place during the Armenian Genocide. Throughout the 20th century, vandalism and destruction of the cultural heritage of opposing ethnic groups has occurred in both Azerbaijan and Armenia. 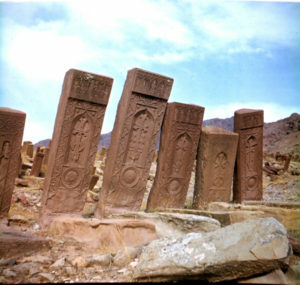 The ancient cemetery located at Djulfa was first pillaged in 1903 to clear a path for railroad construction, destroying nearly 6,000 khachkars. That ‘cultural crime’ was not Azeri in origin; it took place under Russian Czarist administration. The apparently arbitrary allocation of lands to Armenia and Azerbaijan at the end of the Soviet period was typical of Soviet thinking, when lines were often drawn to deliberately divide populations. A multi-ethnic state during the Soviet period, Azerbaijan had a population of almost 500,000 Armenians in 1974. Internal and cross-border strife with Armenia during the Nagorno-Karabakh war was extremely violent, resulting in thousands of civilian as well as military deaths on both sides. Today, almost all the remaining Armenians live in the breakaway republic of Nogorno-Karabakh. 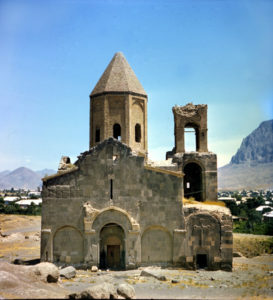 The Azeri government’s policy of deliberate destruction of the cultural record of Christian culture in Nakhichevan did not begin until the last decade of the 20th century. In 1998, when the Azeri government ordered the first massive destruction of the khachkars, UNESCO delayed acting until 2002, after several thousand had been destroyed. But the protest was weak and UNESCO allowed Djulfa to be forgotten. Then, in December 2005, UNESCO again failed to act as Azeri military descended on the Djulfa cemetery, taking a week to smash every one of the remaining khachkars with sledgehammers, load the fragments onto trucks, and dump them into the river that marked the international border. Within a few months, the ancient cemetery had been completely flattened and made into a firing range for soldiers. Despite pleas from the Armenian government and international non-governmental organizations, UNESCO did not speak up to stop this final destruction of the last of Nakhichevan’s khachkars. As Azeri cultural officials are quick to point out, there are medieval Christian churches remaining in other regions of Azerbaijan. The Azeri position that there are not and never have been Christians in Nakhichevan, thereby justifying Azerbaijan’s territorial claims to a traditionally Armenian area, is fundamentally a political matter. For Azerbaijan, it was worth destroying an irreplaceable part of world heritage to defend its political aims. An article penned by Peter Tase appeared in Eurasia Diary, condemning the Pickman and Maghakyan article in Hyperallergic. Tase insisted that “all grave stones were carried by Armenian nationals from Julfa region of Azerbaijan to Armenia.” He characterized the Hyperallergic article as “insidious political offensive and information warfare that is clearly orchestrated by Yerevan’s top officials,” addressing “matters that have never happened throughout ancient and modern history of Julfa and Nakhchivan.” Clearly, for Azerbaijan, this is about politics, not culture. By holding the 2019 meeting in Azerbaijan, hosted by the same government that ordered this cultural annihilation, UNESCO is demonstrating once again that deference to a national government is more important than commitment to international goals of protection. Azerbaijan is an oil-rich nation in the Caucasus region, north of Iran. Since independence from the Soviet Union in 1991, its government has been essentially a hereditary authoritarian state. A series of coups in Azerbaijan overthrew a democratically-elected president in 1993, leading to the rise in power of a former Soviet leader and KGB chief, Heydar Aliyev. The Aliyev family’s dominance has never waned; it is sustained by Azerbaijan’s vast oil wealth and characterized by state violence and a disregard for human rights. Heydar Aliyev’s son, Ilham Aliyev, replaced him as President in 2003. Ilham Aliyev was re-elected president for a fourth term in 2017, after terms were extended in 2016 to seven years. Four other parties boycotted the elections, which international observers stated were characterized by “serious irregularities.” The opposition party received only 3% of the vote. Artist: Jamal al-Din Muhammad al-Siddiqi al-Isfahani, Scribe: Abu Bakr Shah ibn Hasan ibn ‘Ali al-Shahrastani. 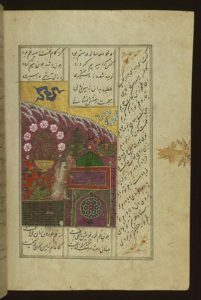 Majnun Visiting his Father’s Tomb, illustrating the poem by Nizami, Walters Art Museum. Wikimedia Commons. The 21st century rulers of Azerbaijan do spend generously on “preserving culture,” and have restored a few Christian churches in other regions. Within Azerbaijan, however, only the cultural narrative that supports the regime counts. Despite Nakhichevan having once been a primary location for Orthodox Christian churches and monuments, none are listed today among Azerbaijan’s World Cultural Heritage Sites, or even the ten sites currently on Azerbaijan’s Tentative List. What still remained of Nakhichevan’s Christian culture has been eliminated from history by an officially mandated cultural erasure over the last 15 years. The destruction is both physical and intellectual. At the same time that Christian monuments have been bulldozed and smashed with hammers, the regime has rewritten history and removed access to records of Orthodox Christian culture dating back to the medieval period in the enclave of Nakhichevan. It should be noted that this cultural destruction is not necessarily based on religious antipathy. It exploits religious differences, but its true character is nationalist, and may be seen in other state actions. Take, for example, the Azeri government’s removal of Persian language inscribed tiles in 2013 from the mausoleum of Nezami Ganjavi in Ganja. The twelfth-century poet, known best as Nizami, although born and buried in what is now Azerbaijan, is revered throughout the Persian speaking world (and beyond) as the greatest romantic poet of the period. He wrote in Persian, not Turkic, and at the time, Azerbaijan did not exist as a country. Nonetheless, in justifying removing the tile inscription, Khalil Yusifli, the director of the Nezami Ganjavi Centre of Azerbaijan National Academy of Sciences, stated that the tiles were being replaced with tiles of the poet’s verses translated into Azeri, to ensure that everyone understood that Nezami was a representative of Azerbaijani literature. 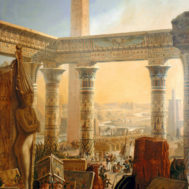 UNESCO’s willingness to ignore what is really going on among member nations, and its failure to demand accountability, is made abundantly clear in the lengthy report published in February 2019 by Simon Maghakyan and Sarah Pickman in Hyperallergic. Because the sites on which Orthodox Christian churches, cathedrals, and graveyards once stood are now barren empty spaces, or the sites of brand-new mosques, the havoc wreaked on Armenian heritage by the Aliyev regime could have remained hidden forever, covered up by false statements and government propaganda. In an amazing turn of fate, an extraordinary record of surveys, documentation, and photographs exists today, thanks to independent researcher Argam Ayvazyan. 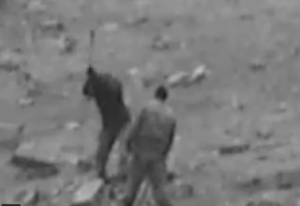 Ayvazyan began to make photographic records in Nakhichevan at the age of 17 in 1964. From that time until 1987, Ayvazyan documented the remains of Orthodox Christian, Armenian, and Muslim heritage in his native Nakhichevan, eventually publishing some 200 articles and over 40 books detailing both Christian and Muslim monuments. During his researches, Ayvazyan often had to conceal his true interest in documenting historical materials that were already politically extremely sensitive during the Soviet period. At one point, he was stopped by police and pulled in for a talking-to by then KGB chief Heydar Aliyev, later to become the first President of the Republic of Azerbaijan, and the father of the current President Ilham Aliyev. Maghakyan and Pickman’s detailed forensic report in Hyperallergic is filled with the photographic documentation collected by Argam Ayvazyan over four decades. This irreplaceable history reveals the full and tragic extent of the Aliyev regime’s deliberate destruction of Armenian Christian monuments and cemeteries. Based upon Ayvazyan’s records and photographs, he documented – and the Aliyev regime has now deliberately destroyed – at least 89 standing churches and cathedrals, 5,840 khachkars – ornately decorated standing headstones – and an estimated 22,000 flat headstones in the region’s cemeteries. All these monuments and cemeteries were recorded by dedicated Armenia-based researcher Argam Ayvazyam from 1964 to 1987. One of the last places destroyed was the Djulfa cemetery, home to approximately 2000 Khachkars. The cemetery was preserved longer than many in Nakhichevan, perhaps because it was on the Iranian border, and it was possible for others to keep an eye on it from abroad. According to Maghakyan and Pickman, a Scottish researcher, Steven Sim, traveled to Nakhichevan in 2005. While he was quickly interrogated and told to leave, Sim at least saw many headstones from the Djulfa cemetery from the windows of the train leaving Djulfa. But that was not to last. Just a few months later, Iranian border patrols spotted about 100 Azeri forces with construction vehicles and sledgehammers destroying the Khachkars in the ancient Armenian Cemetery. Why No Outcry? International Eyes Turned Away. Azerbaijan’s First Vice-President Mehriban Aliyeva meeting with UNESCO Director General Irina Bokova on the sidelines of the Baku-hosted 4th World Forum on Intercultural Dialogue. 05 may 2017. , Office of the President of the Republic of Azerbaijan, Ilham Aliev. The exhibition Azerbaijan – A Land of Tolerance, opened on October 22, 2013, four months after Azerbaijan presented UNESCO with $5 million dollars, helping to offset a serious budget shortfall after the U.S. stopped making payments to the organization in 2011. Soon after, Bokova is said to have facilitated Azerbaijani participation in the UNESCO Leaders Forum, in which President Ilham Aliyev lectured the group on tolerance. 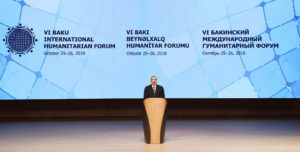 President Aliyev said, “multiculturalism is not just an idea, it is our tradition, a state policy and our lifestyle.” Bokova also made several trips to Azerbaijan to participate in the UNESCO World Forum on Intercultural Dialog, which will hold its annual meeting there again on May 2-3, 2019. The Aliyev regime claims to be a preservers of culture, and promotes that claim through well-financed publicity campaigns in which UNESCO, wittingly or not, has colluded. Ilham Aliyev’s wife, Mehriban Aliyeva, who holds multiple top positions as Vice President of Azerbaijan, President of the Heydar Aliyev Foundation, Goodwill Ambassador of UNESCO and ISESCO, has received medals and positive press coverage for supporting ‘tolerance and interfaith harmony.’ Praise for the Azerbaijan regime has come from UNESCO, the Russian Orthodox Church, and the Vatican. (Six years after the massive destruction of Orthodox Christian monuments within Azerbaijan, the Heydar Aliyev Foundation agreed in 2012 to fund the restoration of the catacombs of Saint Marcellinus and Saint Peter in Rome.) In 2010, UNESCO Director-General Irina Bokova presented the Mozart Medal, a top UNESCO award, to First Lady Mehriban Aliyeva. 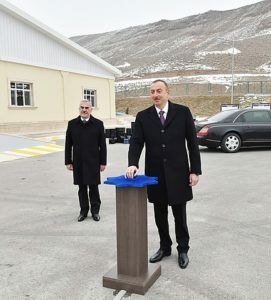 Ilham Aliyev attending a ceremony to launch water systems in Julfa district and surrounding villages. When the Institute for War and Peace Reporting stated that the medieval cemetery at Djulfa had been completely eradicated in 2006, the Baku government claimed the reports were false and insisted that the cemetery was still there. Since then, the regime has routinely denied access to the devastated region of Nakhichevan. 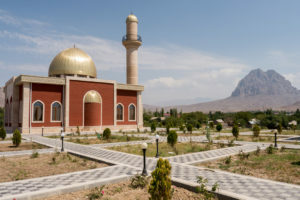 Azeri authorities refused to allow a delegation from the European Parliament to Djulfa in August 2006, a trip which had been scheduled since January of that year. After his arrival in 2011 as American Ambassador, Matthew Bryza demanded to visit the region. Although the ambassador was generally seen as sympathetic to the government of Azerbaijan, he was refused permission to access the site. At the same time, Azerbaijan’s news coverage includes repeated reporting on the poor condition of Muslim historic sites in Armenia, along with claims that deliberate destruction of Azerbaijani heritage continues there. 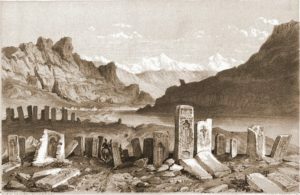 Armenian Cemetery in Julfa, 1830, Francis Rawdon Chesney, The Expedition for the Survey of the Rivers Euphrates and Tigris, 1850 , Wikimedia Commons. Azerbaijan is one of 169 nations that has ratified (in 1992) the International Covenant on Economic, Social and Cultural Rights, which entered into force on 3 January 1976. This Covenant recognizes communities right to access science and culture, and to publicly participate in cultural life. With respect to the religious heritage of Azerbaijan’s Christian communities in Nakhichevan, the rights to freedom of thought, conscience and religion enshrined in these fundamental documents appears to have been tossed aside. The meeting in Azerbaijan could be an opportunity for the world to see how the wanton destruction of cultural heritage in recent decades has not only been perpetrated by terrorist groups and other non-state actors, but also undertaken by government forces. UNESCO’s meeting in Baku could be used to challenge a regime for placing a nationalist agenda above the value of cultural heritage for humanity as a whole. So far, UNESCO shows no sign of raising the issue. State sovereignty is a pillar of current UNESCO policy – but the situation in Azerbaijan shows how weak a protection it is when governments want to alter history. UNESCO’s current policies now appear to be an obstacle to preservation, instead of a means to prevent harm to heritage.